comment Experiência estendida para aproveitar ainda mais a vista de Dubai! Dubai's skyline looks spectacular from the ground but from above it appears to be out of this world as you'll discover on this luxurious helicopter flight. After taking off from the Palm Jumeirah, this Dubai sightseeing helicopter flight takes you over the beautiful Arabian Gulf coastline with views of the famous beach hotels including the most famous landmark – the Burj Al Arab Hotel. Heading inland, take in the skscrapers that make up the Dubai skyline and also see Union Square, Sheikh Zayed Road and the Mall of the Emirates. And of course, no Dubai helicopter flight without cruising past the world’s tallest building, the incredilbe Burj Khalifa. As the flight continues enjoy bird's eye views of the Camel Race Track, Naad al Sheba Race Track, the Emirates Golf Club and the historic Dubai Creek. Soar over the Worlds Islands - 300 sandy islands shaped to resemble a map of the world - and also view the incredible Palm Island before touching back down at the Atlantis the Palm. 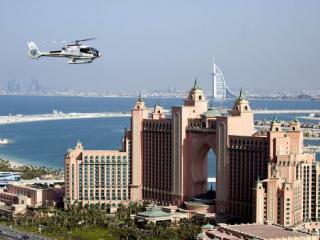 Atlantis The Palm Helipad; Participants must make their own way to the departure location. Comprovante de identificação com foto clara será necessário para o check-in. Reserva com antecedência é necessária. Selecione a sua data preferida no momento da reserva. Os voos partem de heliponto do Atlantis The Palm. Os passageiros deverão organizar transporte próprio até o ponto de partida. Todos os voos estão sujeitos a condições de tempo e visibilidade. Rotas de voo poderão variar devido às indicações do controle de tráfego aéreo ou de outras considerações operacionais e de segurança. O helicóptero poderá transportar no máximo 6 passageiros e seu voo poderá ser compartilhado com outras pessoas. Se você preferir um voo privado, consulte as nossa opções de Passeio Privativo de Helicóptero de 15-25 Minutos sobre Dubai. Há um peso máximo por passageiro para poder participar do voo? Não, mas o peso combinado de todos os passageiros não deve exceder 400kg.